Last updated by suzlipman at July 8, 2016 . What if you could do something simple that involved beauty and fun, didn’t cost a thing, and improved every aspect of your and your family’s health and well-being? That something is as simple as visiting your neighborhood or other park, woods, seashore or other favorite outdoor spot. That’s why National Park Trust has designated Saturday, May 16, Kids to Parks Day. By setting aside one Saturday in mid-spring, NPT hopes to raise awareness of the ease and benefits of visiting a park and foster a connection with our public lands that will lead to lifelong enjoyment and stewardship. Take the Kids to Parks Day pledge to bring a child to a park on May 16. Everyone who registers will be entered to win a Nikon COOLPIX L830 camera! What do you do when you get to the park? That part is easy! Here are 12 Great Activities for Kids to Parks Day. Box ovens employ one of the oldest energy sources of all, solar power. French-Swiss scientist Horace de Saussure was the first to harness the sun for cooking. He used glass to trap heat and create convection while his 1700s peers were still burning mirrors. Anything that can be cooked in a regular oven can be cooked in a box oven. We like to make cupcakes, biscuits, English muffin pizzas, and other items that don’t require long cooking times. Try one of our favorites, Box Oven Pineapple Upside Down Cake. Learn more about how to make a box oven and cook with the sun. Outdoor fun needn’t only happen during the daytime. The nighttime offers lots of opportunities to explore constellations of stars and exciting events like meteor showers, which happen often throughout the year. Many parks offer nighttime interpretive programs, and some U.S. national parks have been designated dark-sky parks, because of their excellent star-gazing conditions and educational opportunities. You can’t help but be infused with a sense of wonder, awe, history and mystery while contemplating the cosmos, as countless people, back to the ancient Babylonians, Egyptians, Greeks and others have done before us. This powerful group game teaches older children about the interconnectedness of living things. We encountered it on a school field trip to a vibrant marsh and have never forgotten it. Learn the rules to Web of Life. The earliest May Day celebrations commemorated Flora, the Roman goddess of flowers and spring. Celebrate the spirit of Flora on May Day, Summer Solstice, Kids to Parks Day, or any time, by making lovely floral wreaths, crowns and baskets with materials found in a park or woods. Bring your art to the park! Finger weaving is especially portable. Every year, at our annual Girl Scout Camporee weekend, this simple, tactile craft occupied girls of all ages, who wove, chatted, and relaxed in nature. If there’s a barbeque handy, consider firing it up and making everyone’s favorite camping treat, s’mores. The gooey creation has been pleasing people in parks since the first recipe was published in the 1927 Girl Scout handbook, Tramping and Trailing with the Girl Scouts. When’s the last time you got a group together in a park for some old-fashioned playground or lawn games? Kids to Parks Day, or any day, is a great time to revive your favorites or learn something new. Games such as Red Light, Green Light, Duck Duck Goose, Mother/Father May I, Capture the Flag, Kick the Can, and the ever-popular Tag, in all its variations have been entertaining people around the world for decades. Here are the rules to these and other classic outdoor games. Try one in a park! Register for Kids to Parks Day & Enter the Buddy Bison Prize Pack Giveaway. In addition to taking the Kids to Parks Day pledge to bring a child to a park on May 16, you can enter my giveaway to receive a Buddy Bison Prize Pack. To enter, take the the Kids to Parks Day pledge and then leave a comment on this post, letting me know you took the pledge and sharing your favorite park activity by Friday, May 15, Midnight, PDT. The giveaway winner will be chosen by random name generator and notified by email. The giveaway winner must respond within 48 hours of receiving the email to receive the prize. Update: Laura has won the giveaway and claimed her prize. Thank you all for participating. Hope you enjoy your outdoor time. The week before Memorial Day is Backyard Games Week, and there’s no time like the present to learn some tried-and-true games, some of which you or your parents may have played during childhood. So gather a few friends or simple supplies and go out and play! They can be called Plainsees, Peewees, Bumblebees, Clouds, Swirlies, Cat’s Eyes, or Beach Balls. They can be made of glass, clay, agate, or steel. Marbles have been used for game play since ancient times in Pakistan, Egypt and Rome, and people of all ages play and compete today. The U.S. National Marbles Tournament has been held on the New Jersey shore since 1922. The British and World Marbles Championship, played annually on Good Friday, goes all the way back to 1588, when two young men duked it out with marbles to determine who would win the hand of a local milkmaiden. While there are many marbles games, Ringer is the classic. Draw a chalk circle at least 3 feet (and as large as 10 feet) in diameter on a sidewalk or driveway, or tape a string circle in place on a carpet. The larger the circle, the more challenging the game. Place the 13 smaller marbles in the center of the circle, in the shape of an X, or scatter them randomly. The first player sits just outside the circle and shoots his or her large marble (or shooter) into the circle, aiming at one or more smaller marbles, with the intent of knocking the smaller marbles outside of the circle, while leaving the shooter inside the circle. To shoot, place one or more knuckles on the ground and flick the shooter marble with a thumb. If one or more marbles are successfully knocked out of the circle, with the shooter left inside, the player collects the marbles he or she shot outside the circle and shoots again from the place where the shooter landed. If the shooter lands outside the circle as well, the next player is up. The second and subsequent players do the same. Shooter marbles stay where they landed during each round. Players can also choose to shoot the shooter marbles of others further away from the circle, so that that player will have a more challenging place to shoot from during the next round. Play continues until all the marbles have been knocked out of the circle. Players count their marbles to determine a winner. Slow Tip: You can make your own marbles, the ancient way, using polymer clay. Roll solid or multi-colored pieces of clay into the shapes of marbles and bake according to package directions. Don’t forget to make a few larger shooter marbles. This classic game never goes out of style and, while it can be challenging at first, players do get better with practice. Sets of jacks can be found in many markets. Scatter the jacks onto the hard surface. Throw the ball up (approximately 6 inches, though this will vary) near the jacks with your dominant hand. While the ball is in the air, scoop up one jack along with the ball, which has now bounced. Put the jack aside. Repeat, this time picking up two jacks. Keep increasing the amount of jacks you pick up. If the ball bounces more than once on that turn, the play moves to the next person. When there are no more jacks left on the playing surface, players count their jacks to determine a winner. It’s called Spillikans in Canada, Plockepinn in Sweden, Mikado throughout Europe, and Kau Cim in China, where the sticks were used as a fortune-telling device. Canisters of pick-up sticks can usually be found in toy and variety stores – or make your own from twigs! Hold the pick-up sticks in a bundle, then release them so that they land in a pile. Players take turns trying to remove one stick at a time, without disturbing any other sticks. When a stick from the pile is disturbed, the next player takes a turn. Some players use a designated stick to remove other sticks. Commercial sets of sticks are often color-coded, so that some sticks have higher point values. When all the sticks have been removed from the pile, players total either their number of sticks or the values of the sticks based on their colors, according to package directions. Because it’s a game of strength, Red Rover should be played with a few precautions, which are noted. One benefit of the sometime-controversial game, is that the game ends when everyone ends up on the same side, so there are no winners or losers. Divide into two teams. Each team forms a line, approximately 30 feet from the other. Team members all hold hands. The person named breaks from his or her line and runs as fast as possible in between any two players on the opposing team, in an effort to break through those team members’ arms. If the runner breaks through, causing those opposing players’ hands to drop, he or she chooses one person for the opposing team to join his team, and they both go back and join in that team’s line. If the runner fails to break through, he or she joins the opposing team’s line. Each team alternates calling people over until all the players end up on one side. Note: To prevent injury, players should join hands, and not arms, so that they can easily unlink, and keep their hands at waist level. Players should be roughly the same size. South Asians know it as Kho Kho, Ghanaians as Antoakyire. German children play a version called Plumpsack, which involves dropping a handkerchief at one player’s spot. Young children play this timeless game around the world. Players sit in a circle, facing each other. Choose a player to be It. That person walks around the outside of the circle. As they walk around, they tap each person on the head and say, for the first few or many, “duck”, “duck”, “duck”. Finally, It taps a person on the head and says, “goose” and begins to run around the outside of the circle. The person who is tapped as a goose gets up and chases It around the circle. If the goose is able to tap It before he or she sits down in the goose’s spot, then It goes into the center of the circle. If the goose does not tag It, then the goose is the next It and the last It returns to the circle. Players can only come out of the middle once a new player gets tagged and goes in. One player is chosen to be the Stoplight. That person turns their back to the group, which forms a line approx. 10-30 yards away (depending on ages of players.) The Stoplight calls out “Green Light” and the players advance toward it as quickly as they can. When he or she wishes, the Stoplight calls out “Red Light”, at the same time turning around to see the runners. The runners must stop immediately. Any player caught moving after a call of “Red Light” has to go back to the starting line. Green lights/red lights are repeated until the first player reaches and tags the Stoplight and is declared the winner. If all the players are out before they reach the Stoplight then the Stoplight wins that round. The winner becomes the new Stoplight. Slow Snippet: Many cultures count 1-2-3 in their language and then shout a particular word instead of saying “Red Light”. In Mexico, it’s “calabaza” (pumpkin), Israel “herring”, Italy “estrella” (star), and France “soleil” (sun). This game has both random and whimsical aspects that speak to small children, in addition to requiring some creativity in thinking up and executing new steps. One player is chosen to be the Mother. The other players form a line approx. 10-30 yards away (depending on ages of players.) The first player calls out, “Mother may I take _____ (number) _______ (type) of steps?” Mother answers either “Yes, you may” or “No, you may not,” and the player advances or stays where they are. (Some people play that Mother can offer an alternative number and type of step.) Players continue to inquire and take various steps. The first one to reach Mother wins and is the new Mother. Another game from many of our childhoods, this one works in a backyard, field or neighborhood street. You’ll need: 2 flags or bandannas. The games works best in an area with varied terrain, such as trees or other landforms. Divide into two teams. Mark a line in the center of the play area. Each team’s territory, or base, is one either side of the line. Each team also picks a spot for its Jail, usually far from the flag. Determine a time period (5-10 minutes) during which each team hides its flag within its own territory, usually in the part farthest from the opponent. Once flags have been hidden, the teams meet in the middle. Each player tries to enter the other team’s territory and find its flag. In addition, the player has to bring the flag back into his or her own team’s area without getting tagged by an opponent. Tagged players go to Jail and sit out the game until tagged by a teammate, at which time they can rejoin the play by walking back into their own territory first. Players can only be tagged within the enemy’s base. If a player is tagged while transporting the flag, the flag is dropped at that spot. The game is won when an opposing flag is successfully captured and brought to the home base. My husband, Michael, has fond memories of epic Kick the Can games in his Pennsylvania neighborhood growing up. They’d continue for hours, as good games often do, with kids hiding behind trees in the conjoined backyards, strategizing and running, sometimes long after dark, on leisurely summer nights. Place a can on the ground and designate an area near it as a jail. Choose an It, who counts to a high number (usually between 50 and 100) while the other players hide. When the number is reached, It moves away from the base and starts to look for the other players, who in turn are attempting to return to the can to kick it. If It sees player, It calls out that person’s name, (while shining a flashlight on them, if at night) and tries to kick the can first. If that happens, the player goes to jail. If the player reaches the can first and kicks it, then that player can hide again and any jailed players are freed. The game ends when everyone except It is in jail. Based on the simple premise of chasing and catching, Tag is one of the most common and enjoyable games around the world. It’s great for giving players an opportunity to run around. There are tons of creative and cultural variations to Tag, which may be known as Tip, Tig, Dobby and Chasey. To play, simply choose an “It”, who counts to a set number before chasing others. When It tags a player, that person becomes the new It. Some play with a safe, tag-free Base. Once players are tagged by It, they are frozen and must stay perfectly still. They become unfrozen when another player runs up to them and tags them. If a frozen player moves before being unfrozen, and is seen and called by It, that player is out of the round. On offshoot of Freeze Tag – When tagged, players freeze in an especially dramatic pose, like a statue, and stay there until tagged again to be free. Once a player is tagged by It, the two join arms and become a blob, which chases players together to try to tag them. Other players who are tagged also join arms and become part of the blob. Some play that when the blob reaches four people, one splits off to become a new blob. The last person standing alone becomes the new It. Players all start at one end of the playing area. It, in the middle, calls, “Fishes, come swim in my ocean!” Players try to run toward the other side without being tagged or having a ball successfully thrown at them by It. Once tagged, players become tentacles, who stand in the spot where they are tagged, but stretch their arms in an effort to help tag others. Players who reach one side can be “safe” or can proceed back to the other side. The last person standing becomes the new It. Slow Tip: Try Octopus Tag in a swimming pool. Choose two players as It. The remaining players start at one end of the playing area and count off, in order, “Pepperoni”, “Mushrooms”, “Sausage”, “Olives” and “Cheese”. The two Its, or Pizza Makers, take turns calling a topping. Players who are that topping try to run past the pizza makers to the other side of the playing area, where they are safe. Once tagged, players sit or stand, and stretch their arms in an effort to help tag others. Players who reach one side can be “safe” or can proceed back to the other side. The last two people standing become the new pizza makers. When players see It approaching, they must crouch down and say the name of a TV show to be safe. Show names can only be used once per round. If a player can’t think of a TV show in time, he or she is It. It must move once a player crouches down. You can also play with Girls’ names, Fruits, Animals, any category you’d like. Everybody is It, meaning anyone can chase and tag anyone else. If a player is tagged, he or she “freezes” by bending over forward. Players can un-freeze the frozen by running through the hoops they make with their bodies. This game usually ends when everyone is tired. Summer is near, and with it usually comes longer days, less scheduled time and more time outdoors. Whether you have a backyard, front lawn, porch, driveway or deck, summer can offer the kind of simple outdoor family fun that you probably remember from your own childhood. Here are a few ways to welcome wildlife, play classic games, and enjoy the kinds of outdoor activities that get people together and create summer memories. 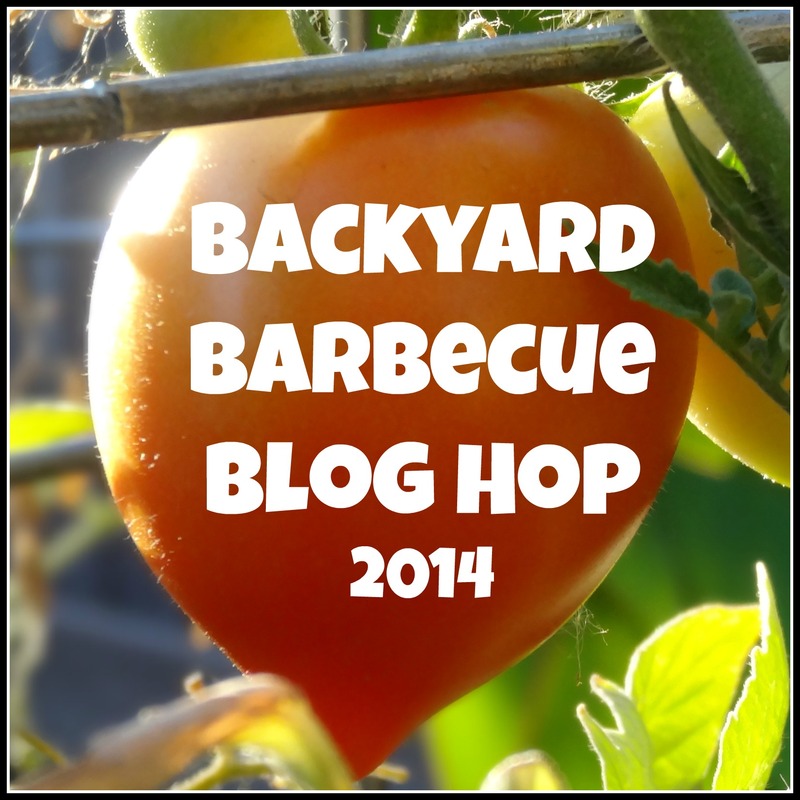 Note: This post is part of the Second Annual Backyard Barbecue Blog Hop. I am so excited to be joining with my blogger friends to create a collection of fabulous ideas for family fun this summer. Be sure to visit all of our co-hosts (links below) to see their amazing posts and be sure to share yours at the end! It’s so much fun to attract birds and butterflies to our yards and homes, while actually helping out local wildlife by feeding them. Plant butterfly-friendly plants this summer, or make this easy bird feeder, which will have you backyard bird-watching in no time. Experiment with different kinds of seeds to see which birds each attracts. Or ask for advice at a plant nursery or pet store. Cut a heart or other shape out of cardboard, using a template or free-hand. Poke a hole toward the top and run the string through it. (If using a ribbon, you might want to string it after the mixture has dried a little, using a hole to poke through the hole, as needed. In mixing bowl, combine peanut butter or other spread with meal, if using. Spread that mixture over the both sides of the heart with the knife or spoon. Pour the birdseed and feed ingredients onto the plate. Place the heart into the seeds. Hang your feeder from a tree branch or window eave that offers some shelter from wind and weather if possible, as well as a view of visiting birds. Slow Tip: You can also use a toilet-paper tube, and either string it up or place it right onto a branch. You’ll need: Approximately 41 twigs. Hold the twigs in a bundle, then release them so that they land in a pile. Players take turns trying to remove one stick at a time, without disturbing any other sticks. When a stick from the pile is disturbed, the next player takes a turn. Some players use a designated stick to remove other sticks. When all the sticks have been removed from the pile, players total their numbers of sticks to determine the winner. This is an enchanting project that mirrors the intricate work of busy spiders, and provides a whimsical and colorful garden object when finished. Beads of your choosing. Make sure the beads and wire are a compatible size. Clip the pointed tips from the skewers. Put the skewers in a bundle. Cut a 12” piece of wire and wrap half of it tightly around the center of the bundle. Spread the skewers out until they all point outward like an asterisk, crossing in the middle. Continue to wrap the wire to secure the new shape. Cut a piece of wire approx. 18”. Wrap one end of the wire around one of the skewers twice, about an inch form the center. String beads along the length of the wire, and then wrap the wire twice around the next skewer. Continue until you are back to the first skewer. Wrap the wire to secure it. Cut the next pieces of wire 24”, 30” and 36”, and string and bead them around the skewers, as above. Place or hang your spider web in your garden. Slow Tip: Beads can be strung tightly along the lengths of wire, or room can be left for the wire to show through. Slow Tip: Try beading flowers, leaves, butterflies, ladybugs, or other garden features. These fun, easy games require little or no equipment and have been creating memories for generations. Players sit in a circle, facing each other. Choose a player to be It. It walks around the outside of the circle, tapping each person on the head and saying, for each tap, “duck”, “duck”, “duck”. Finally, It taps a person on the head and says, “goose” and begins to run around the outside of the circle. The person who is tapped as a goose gets up and chases It around the circle. If the goose is able to tap It before he or she sits down in the goose’s spot, then that person is It again. If the goose does not tag It, then the goose becomes the new “it”. One player is chosen to be the stoplight. That person turns his or her back to the group, which forms a line approximately 30–90′ away (depending on the ages of players). The stoplight calls out, “Green light!” and the players advance toward the player who is the stoplight as quickly as they can. When the stoplight wishes, he or she calls out, “Red light!” while turning around to see the runners. The runners must stop immediately. Any player caught moving after a call of “red light” has to go back to the starting line. “Green lights” and “red lights” are repeated until the first player reaches and tags the stoplight and is declared the winner. If all the players are out before they reach the stoplight, then the stoplight wins that round. The winner becomes the new stoplight. Whimsical bubbles are a great addition to a summer backyard. They provide hours of entertainment at very little expense. In fact, there’s no need to spend money on commercial bubble mixes at all. A large batch can be left in a bucket or tub for days, or even a week or two, without losing its ability to form bubbles. Bubble mixes are best made at least ½ hour before you need them, so they can settle. Use Dawn brand dishwashing detergent, if you can find it, for large, firm bubbles. Joy is second-best. If you’re using the same container to measure both the water and the detergent, measure the water first to prevent detergent foaming in the container. If your water is very hard, you may want to use distilled water. Stir the solution gently. It should be smooth, not sudsy or foamy. Here are some fun ideas for bubble play and experimentation. Sing traditional or silly campfire songs like Go Bananas, She’ll Be Comin’ Round the Mountain, Boom Chicka Boom, and Rose Rose. over it and make a peace sign (for ears) with two fingers. Make s’mores, banana boats, hobo popcorn and other classic camp treats. Be sure to visit all of our Backyard Barbecue Blog Hop co-hosts to see their amazing posts and be sure to share yours at the end! If you are age 6-12 and you have an original idea for a backyard game, you could win a $10,ooo scholarship, or enter a game as a group and win a $15,000 donation to the non-profit of your choice. Now in its third year, the CLIF Kid Backyard Game of the Year Contest fosters creativity and outdoor play by encouraging innovative games that don’t require any special equipment, but rather sports and other items one would typically have around the house. One of last year’s winning games, North Pole South Pole (pictured above), encourages players to be “persistent penguins” who gather fish from a fishing hole before depositing them at their North or South Pole. The equipment? Hula hoops, pillowcases and water balloons. Download instructions for North Pole South Pole and other winning games. The entry deadline is June 17. The finalists will receive a trip to San Diego for the July 27 Backyard Game playoffs. Download a complete set of rules. As a bonus, the 2013 judges include Stacy Tornio and Ken Keffer, co-authors of the fantastic Kids Outdoor Adventure Book, which I reviewed on this blog, and which also encourages outdoor play and discovery throughout the year. So, what are you waiting for? Put your thinking cap on and get ready to innovate and play. The National Football League has announced a new campaign to help reverse the trend of childhood obesity. The NFL Play 60 Program encourages kids to be active for 60 minutes each day through school and community events. They are also sponsoring the NFL Play 60 Invention Contest, to inspire kids 6-13 to invent their own game, activity, piece of fitness equipment, football-themed innovation, or training device for a chance to win $5,000, a 3-day/2-night trip for two to the Grand Prize Event, and an NFL Prize Pack. Two finalists and 12 semi-finalists will also receive prizes. The contest site offers brainstorming tips and inspiration to get you started. Many NFL players and other athletes utilize a simple and extremely inexpensive piece of fitness equipment to help them stay in shape – a jump rope. Jumping rope has gone in and out of fashion since ancient Egypt, when both men and women jumped over vines. It wasn’t until the 20th century that jumpers incorporated the sing-song games and rhymes that many of us associate with childhood and particularly girls. As a fan of simple and inexpensive games and equipment, as well as the origin and continuation of playground games that are passed down through the generations through oral history, I love everything about jumping rope. As inspiration, here are three fitness benefits to jumping rope. It can be easy to fit jumping rope into your 60 minutes of daily fitness. Below are some fun jump rope games that will keep you singing and laughing as well as help keep you fit. They are games my mom taught me and I taught my daughter. Who knows, you might invent the next jump rope or other fun game. One regular jump rope for one person, or a longer jump rope for two turners to turn, while a jumper (or more) jumps. The jumper jumps over the rope each time it hits the ground. Jumpers can jump in one jump each turn or one big jump followed by one smaller jump each turn. A turn ends when the jumper fails to jump over the turning rope. The following are classic, easy jump-rope games. They don’t have tunes, so much as chants, so they are especially easy to pick up. A my name is ____ and my husband’s name is ____ and we live in ____ and we sell ____. For example: A my name is Alice and my husband’s name is Al and we live in Albuquerque and we sell Apples. B my name is Betty and my husband’s name is Bob and we live in Boise and we sell Beans. Jumpers move through the alphabet as long as their turns last. New jumpers usually start with A (that makes it easy to compare how far each gets) and choose new names. This jump-rope game is a little more advanced, as it requires player to pantomime the activity they are singing about (to the best of their abilities) as they are jumping. Teddy Bear, Teddy Bear, that will do! Teddy Bear, Teddy Bear, say good-night! The following games involve counting as far as jumpers can get during each turn. Don’t forget the Red. (pause) Hot. (pause) PEPPERS! On “Peppers”, start turning the rope doubly-fast, counting a point for each turn. The jumper jumps until they miss and are out. went downstairs to kiss a ‘fella. By mistake she kissed a snake. Apples, peaches, pears and plums. Tell me when your birthday comes. Have an idea for a NEW way to get active? Encourage your kids to enter the NFL Play60 Invention Contest! Enter today! Want a free NFL Play60 poster? Email info@bkfk.com with your mailing address to request one! These jump rope games were adapted from Fed Up with Frenzy: Slow Parenting in a Fast-Moving World, which contains this and 300+ more fun family activities. This post is sponsored by NFL Play 60. The views expressed are my own. American Academy of Pediatrics Advocates Recess for Kids: try these games! Recess during school offers children cognitive, social, emotional, and physical benefits they don’t get through academics alone. Recess “promotes social and emotional learning and development” through “peer interactions in which they practice and role play essential social skills.” Children learn negotiation, cooperation, sharing, and problem solving, as well as coping skills, such as perseverance and self-control. Recess can help offset risks to childhood obesity. The AAP also noted that some schools cite safety issues as a barrier to recess and free play and offers steps to protect children while offering free and unstructured play. Read the complete AAP Policy Statement on The Crucial Role of Recess in School. Many of us grew up with free play and recess games, some of which were made up on the spot, and some of which we learned from others. Here are a few games that kids (and even parents and teachers) may not know, which can add to recess and other fun and play. Many more playground and other game instructions can be found in my book, Fed Up with Frenzy: Slow Parenting in a Fast-Moving World. Not sure what to do with that four-square court painted on your school playground? This classic game couldn’t be easier or more inclusive. If you don’t have a four-square court, you can easily draw your own with chalk. If there isn’t a court, draw a large square, approximately 16′ × 16′. Divide that into four squares, each 8′ × 8′. Letter the squares clockwise, from A to D. The player in the A square begins by bouncing the ball once in his or her own square, then hitting it underhand so it bounces into the D square. The receiving player then hits the ball into another square, with play continuing until the ball bounces more than once or goes out of bounds. When that happens, the player who didn’t hit the ball in time, or hit it out of bounds, moves to the D square, and the other players move up in the alphabet. If there are more than four players, a waiting player in line replaces the one who would have moved into the D square, and that player goes to the back of the line. Play continues without anyone having to permanently leave the game. Jumping rope has gone in and out of fashion since ancient Egypt, when both men and women jumped over vines. It wasn’t until the 20th century that jumpers incorporated singsong games and rhymes. Many of these are passed down through the generations like oral history, with different regions using different chants. I learned many of these from my mom and passed them down to my daughter. One regular jump rope for one person, or a longer jump rope for two turners to turn while a jumper (or more) jumps. The jumper jumps over the rope each time it hits the ground. Jumpers can jump in one jump each turn or take one big jump followed by one smaller jump each turn. A turn ends when the jumper fails to jump over the turning rope. The following are classic, easy jump-rope games. They don’t have tunes so much as chants, so they are especially easy to pick up. This is a fun add-on game that also calls for a little creativity and is different every time. If the jumper hasn’t tripped up, he or she moves on to the letter B: B my name is Betty and my husband’s name is Bob and we live in Boise and we sell beans. Jumpers move through the alphabet as long as their turns last. New jumpers usually start with A, which makes it easy to compare how far each jumper gets, and choose new names. This jump-rope game is a little more advanced, as it requires players to pantomime the activity they are singing about (to the best of their abilities) as they jump. Teddy Bear, Teddy Bear, tie your shoe. Teddy Bear, Teddy Bear, say your prayers. Teddy Bear, Teddy Bear, turn out the lights. Apples, peaches, pears, and plums. Count one month for each turn of the rope successfully jumped. I hope you all take the AAP recommendations to heart and enjoy recess and play! Pre-school and Kindergarten Graduations: Too Much Too Fast?